1 foil stamped area on Side 1 of uncoated 90lb Forest Green Hopsack stock. 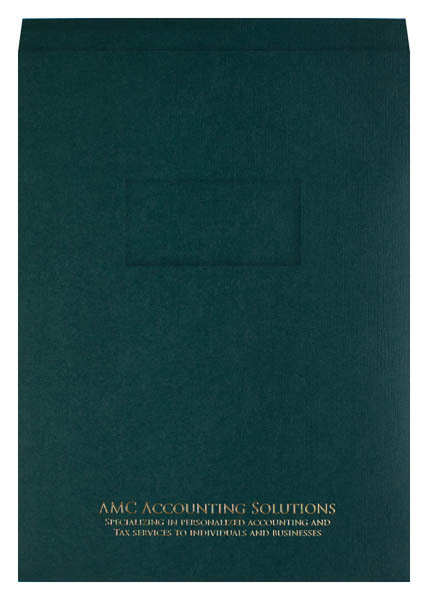 Forest green stock and Metallic Brass foil are the perfect color palette for AMC Accounting Solutions, symbolizing paper money and new coins. Serif text looks respectable and traditional, as do the panels' crisp, square corners. The window's precise die-cut likewise creates a sharp brand image suggesting professionalism. Let clients preview their documents through a convenient 4" x 2" window on the front cover. Placing a title page behind the window makes the design highly versatile, as you can insert a new title page for each client or season of your work. Staple 8 1/2" x 11" documents to the 3/4" tab on the right side to keep them in order, or place loose papers in the v-split left pocket. Customize the pocket with an original logo, copy, or other design element to spice up the interior.